Well, although I was in a slight rush when I made this digitally-edited painting, at least I was feeling slightly more inspired than I was when I made yesterday’s painting. Even so, this painting is more of a practice painting than anything else. Well, it’s the end of the month and that means that it’s time to give you a list of links to my favourite ten articles (plus a couple of honourable mentions) about writing, art and/or comics that I posted here this month. All in all, this month has been a reasonably good one in terms of articles, although I ended up writing a ridiculously large number of articles about making webcomics. 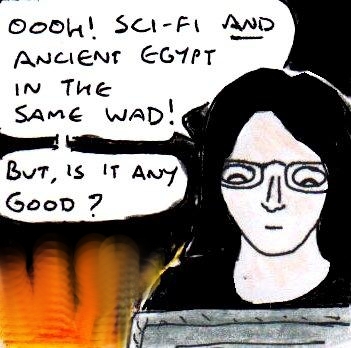 I don’t know, I seem to be going through a “webcomics” phase at the moment (and the fact that I was busy with the upcoming follow-up to “Damania Restricted” at the time of writing these articles probably had something to do with it too). Well, I was feeling fairly uninspired when I made today’s painting. In fact, this painting also required some fairly extensive digital editing after I scanned it, since I messed up the colour scheme in the original painting (and because I wanted to add some stuff to the background digitally, and cover up a couple of mistakes too). Well, after seeing some gameplay footage from this WAD in a Youtube video, I thought that I’d take a look at a 32-level “Doom II” WAD from 2010 called “Epic 2“. 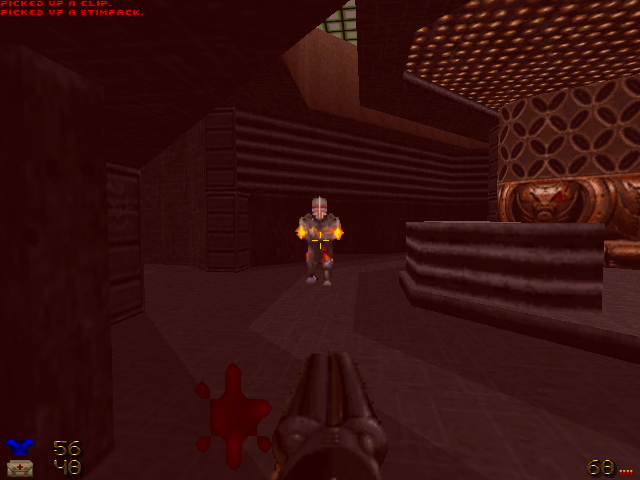 Before I go any further, I should probably point out that I used the “GZ Doom” source port whilst playing this WAD. Likewise, at the original time of writing this review, I was somewhere between halfway and two-thirds of the way through this WAD – so, this review only reflects my impressions of the game up to that point. Unfortunately, at the time, I ended up moving on to another WAD before I quite had a chance to finish “Epic 2” if I remember rightly. One of the first things I will say about this WAD is that the settings in it are really interesting. 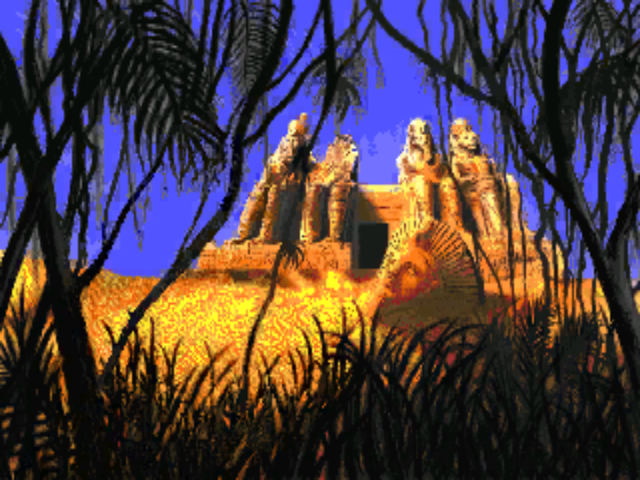 From what I’ve played so far, there are levels set in both ancient Egypt and on a mysterious alien spacecraft of some kind. As someone who is both a sci-fi fan and a fan of ancient Egypt, it’s really cool to see both of these things together in the same WAD. Seriously, it’s a little bit like “Stargate SG-1”. 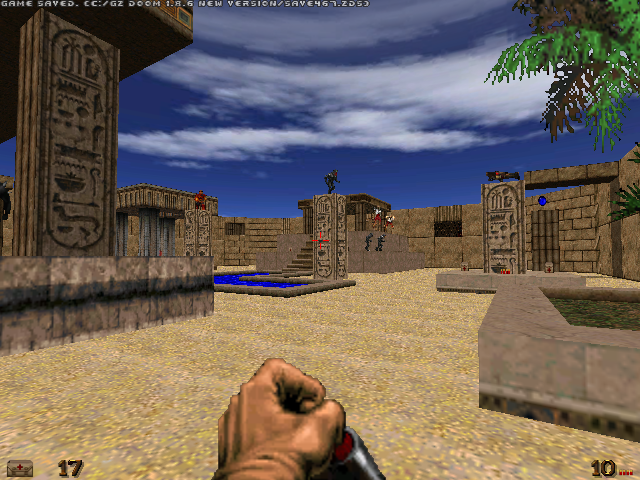 Although this WAD gets off to a bit of a slow start, with the first four levels mostly taking place in a series of slightly gloomy ancient Egyptian crypts, temples, catacombs and tunnels, with the occasional bright outdoor area to break up the monotony – the fifth level is more than a little bit reminiscent of the first “Serious Sam” game in terms of both settings and gameplay. The sci-fi levels are surprisingly creepy and innovative too, with a slight “Duke Nukem 3D” feel to them. Also, the thirteenth level of this WAD is absolutely outstanding. Basically, you’re stuck in a rather claustrophobic series of corridors, with relatively little ammo and lots of arch-viles. In addition to this, the background music in this level is a wonderfully creepy track that sounds a lot like something from “American McGee’s Alice“. I don’t think that you can get more awesome than this. Even though this level reminded me quite a bit of one spectacular level in a WAD I played quite a while ago called “Equinox“, it’s still a really cool (and creepy) level. Seriously, there should be more of these levels.. 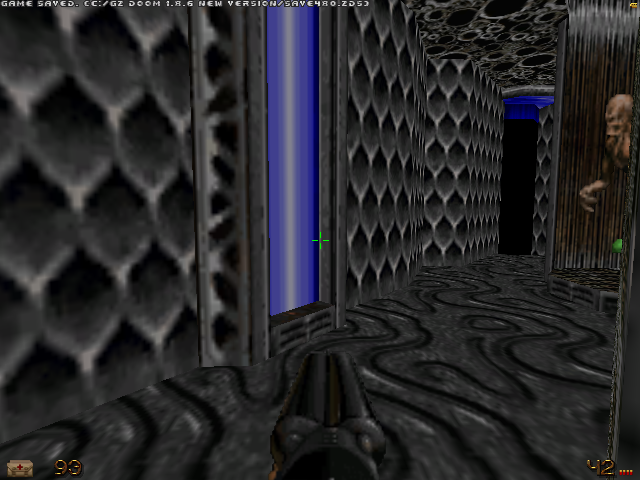 In terms of difficulty, this WAD is for experienced “Doom” players only. If you like your WADs to be fiendishly challenging, then you’ll love “Epic 2”. 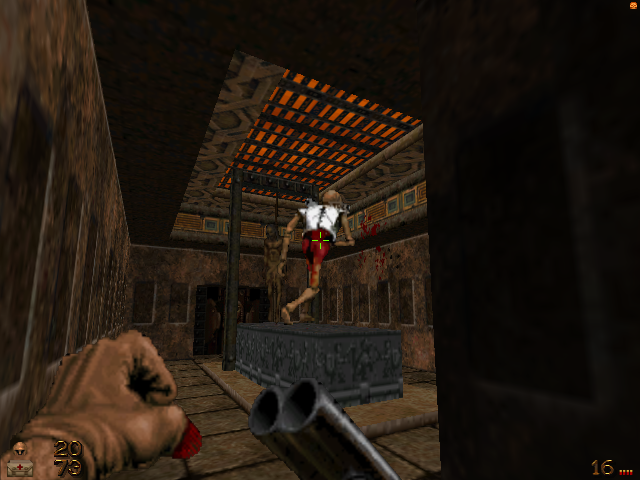 Although each level I’ve played contains a large number of monsters, proper “slaughtermap”-style areas (with far more monsters than you can actually fight) are fairly rare in this WAD. Even so, you’re still going to have to use a lot of tactics and strategies if you want to get through this WAD. This WAD also takes a bit of a traditionalist approach to the gameplay – so, jumping is disabled by default. Interestingly, this ISN’T the combination you have to use later in the level. You have to do something else to find the actual combination. Like this wondefully macabre room. 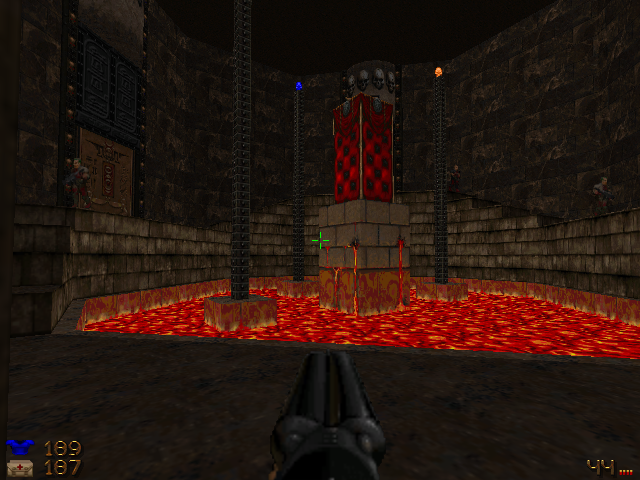 And there’s also molten lava in one of the other early levels too. 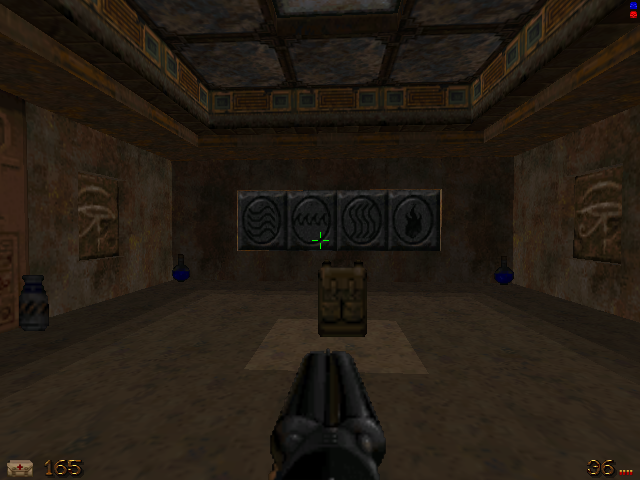 …And this cool teleporter in the last “Ancient Egypt” level. As for the monsters, a few of them (the imps, the chaingun zombies and the pain elementals) have slightly different textures. However, this WAD does contain a new monster. During the spaceship levels, you’ll encounter aliens that can appear and disappear at will. These aliens also shout at you (I think they say “there he is” or “there she is” or something like that) when they see you too. All in all, from what I’ve played so far, I really like this WAD. It’s enjoyably challenging and surprisingly atmospheric. 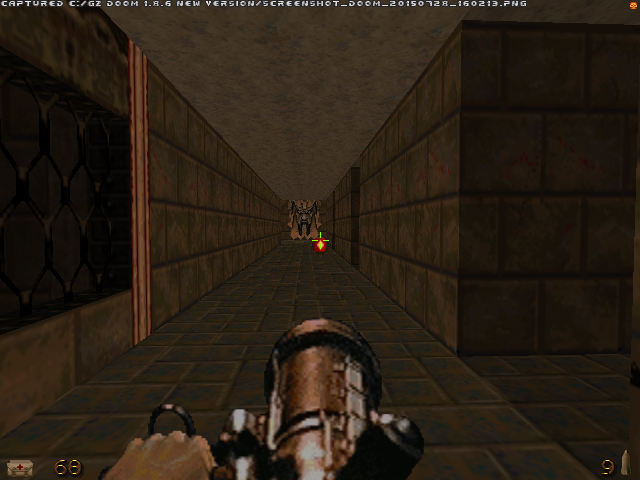 Yes, the really impressive levels don’t appear until a little way into the WAD but it’s certainly a fairly solid “Doom II” WAD and it’s worth checking out. If I had to give it a rating out of five, I’d give it a four. As I mentioned in yesterday’s art post, I had an interesting dream that contained a lot of fascinating locations and I’ve tried to turn a couple of them into paintings, albeit slightly rushed ones. I’m not sure if they’ll be a third painting in this series or whether I’ll paint something else for tomorrow. Although I’m busy making the next mini series of my long-running webcomic (it’ll be posted here in early- mid August, but you can check out the previous mini series here, here, here and here) at the time of writing, I thought that I’d talk very quickly about humour types in webcomics. One of the things that I noticed with a couple of my previous comics projects is that they didn’t contain as many types of humour as they probably should. What do I mean by this? Well, a lot of the humour was very cynical humour. Don’t get me wrong, this is a great type of humour and it’s easy for a cynical person like myself to write. But, well, it can get a little bit predictable and boring after a while. It can go from “Ha! I actually wrote that!” to “Meh. Time to be cynical again“. So, it can sometimes be a good idea to include different types of humour in your webcomic just to keep yourself interested in it. In addition to this, using different types of humour in your webcomic will also make it more interesting to read for the simple reason that, like anyone else, the members of your audience all have a subtly different sense of humour from each other. In my upcoming series, I’ve made an effort to include a few different types of humour in order to add a bit more variety. In addition to the usual cynical humour, there’s cheerful humour, random/surreal humour, nerdy humour, slapstick comedy, character-based humour and even an old running joke too. It’s even funnier when you read the whole comic (which will be posted here on the 11th August). But, it’s a good example of character-based humour, with a slight hint of cynicism too. Whilst you shouldn’t include lots of different types of humour in your comic just for the sake of doing so, it’s worth doing if the opportunity arises and if you think that a different type of joke will work well in that particular comic. If it works in the context of the comic that you’re making, then using several types of humour can make things more interesting for both you and your audience. Well, today’s (fairly heavily) digitally-edited painting is the first of a very short series of paintings (it will be at least two paintings long, possibly three) that are based on interesting locations in a dream that I had the night before I made these paintings.